A less dorky, flap-free way to wake up those cagers! 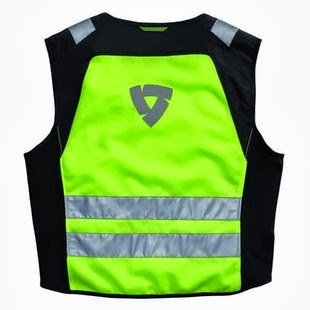 For many years, I've carried a reflective vest to use at night or in rain or fog, figuring that not getting run over outweighed the dork factor. However, I've never worn plain black gear until recently when I purchased a Rev'It! Ignition 2/Gear 2 combo, primarily for commuter-duty, which convinced me I needed something to make me more visible in ALL conditions. Enter the Athos vest, with its eye-poppingly hi-viz. It's sooo much better suited to motorcycle use than the construction-worker types I've used in the past: it's snug, aerodynamic, securely attached with a zipper, won't fall off every time you don or doff your jacket, and doesn't flap around in the wind. With the retro-reflective strips and Rev'It! logos front and back, it's an excellent conspiscuity device day and night. 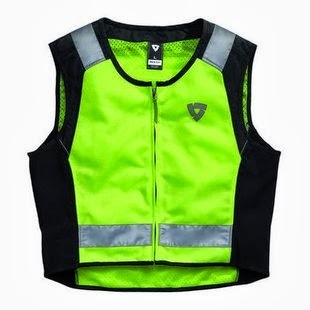 At $60, the Athos is more expensive than the construction and emergency services reflective vests, but because it's designed specifically for motorcycle use, it really can't be compared to the others on a cost basis. However, I do think the Athos is a bit overpriced. Sizing: Taking RZ's advice, I bought a Large (I would've bought a Medium if left to my own devices), which fits great over my size 52 Ignition 2 jacket (which also fits a bit small). More hot air: The vest flows a decent amount of air, though it does somewhat reduce flow thru the mesh portions of my jacket, a trade-off I'm willing to make. Surprisingly, my sophisticated tests (blowing air thru it) shows that air outflows easier than it inflows. She blinded me with, well, you know: The color of the hi-viz portions are (to my eye) more yellow than the green-ish product images on RZ's site. It's still plenty hi-viz, tho, and really "pops" against my black jacket. I ride like I'm invisible nonetheless. Just stuff it! : The vest comes with a nice hi-viz stuff sack, which I use to stash other junk in a side case because I wear the vest any time I'm wearing my new black/black suit. Etc. : While I don't mind it not having pockets because I carry almost nothing in my outer gear (which explains the bulging tank bag), you may. The vest's zipper is "left-handed" like much Euro clothing is. I've only had the vest for about a month so I can't comment on durability, which I have to say is a weakness in some Rev'It! gear. I bet cleaning bug innards off the hi-viz material will be difficult. The zipper is branded "SBS."